This plate was probably made in Iznik, in north-west Anatolia. By the 1530s, small sprays of tulips and other recognisable flowers were a common motif on Iznik ceramics. From the 1550s these were replaced by compositions on a larger scale, such as this design with a sailing ship. The Ottoman court renewed its patronage of Iznik ceramics during the construction of the Süleymaniye mosque in Istanbul in 1550 to 1557. The first Iznik tiles were produced, and potters added a bright red to the range of colours painted under the glaze. This was achieved with a slip (liquid clay) made from a special clay. Deep dish depicting a European-style sailing ship at sea. Crude spirals in the rim approximate Chinese wave-motifs. 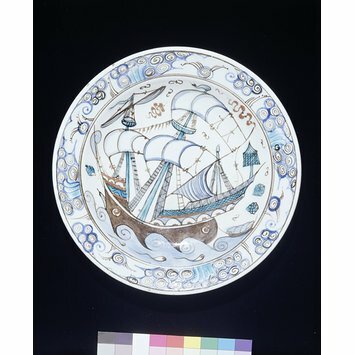 This curious plate is one of a number of Iznik wares of the early seventeenth century which depict sailing ships. The painter has made an admirable effort at realism, as can be seen in the puffed-out sails and the inclusion of details like the crow's-nests; yet abstract motifs remain a staple of the genre, as can be seen in the S-shaped "clouds" in the sky. Deep dish depicting a European-style sailing ship, Turkey (probably Iznik), 1625-1650. White earthenware painted in underglaze colours.